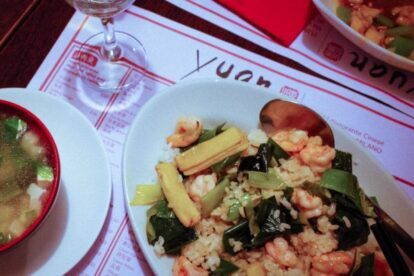 I still remember the first time I came to Yuan for dinner with one of my best friends. I was initially skeptical as some Chinese spots in Milan are often very greasy and commercial…far from a real authentic Chinese meal… nonetheless I decided to give it a go and I was very pleasantly surprised. The restaurant is right near the Duomo, yet has the décor and vibe of a Chinese spot you would find in NYC or Montreal. The space is bare, minimal and it almost makes you feel like they put together a restaurant in an old run down space. Once you walk in and realize it is full, and mostly of Chinese tourists and Asian people, you quickly come to think that when the food is so good who cares about the interior design! On the contrary, the empty décor and minimal table arrangements give a twist and charm to this spot. The menu is never ending and I recommend almost everything. My favorites are the broccoli, stir fry rice and shrimp with veggies. On a side note, the wine is cheap and good which makes for a perfect fun evening and casual dinner with your closest friends!